The time has come again to get out our folding chairs and blankets to enjoy the films projected on the big screen outdoors at the place de la Paix ! Once again this summer, SAT and Quartier des spectacles will present a series of 16 free film screenings at the place de la Paix, every Tuesday from 9 PM, starting June 13 through September 16 (and also on June 13, July 12-13 and September 26). Kicking off with SPASM festival on Friday, June 13, the programme will unfold with collaborations by Dérapage, Kino, POP Montréal, Fantasia, the NFB, Prends ça court!, the Orchestre de la francophonie, Montreal First Peoples Festival, the Montreal International Black Film Festival, Cinemania, Cinéma Politica, the Rencontres internationales du documentaire de Montréal, the Festival du nouveau cinéma, Double Négatif and the Festival International du Film sur l'Art ! Here comes the next episode in the Friday the 13th series, no, not with Jason Voorhees, but with SPASM ! Next October, the SPASM festival will be celebrating its 13th edition and throughout the years, horror films have often been the stars of the party. And so, to celebrate this Friday the 13th of June outdoors, SPASM will dig into its archives to select the most gore, juicy, scary and totally hilarious short horror films they can find ! A unique event of audio-visual exploration, Dérapage invites, every year, artists from different disciplines to create a non-narrative audio-visual work, with sound, less than 3 minutes long. You’re invited to a “Best Of” event in the park, showing off the best of their last edition, in addition to the films that have been the highlights of the event over the last couple of years. This year marks Kino’s 15-year anniversary. To celebrate, each of their events are tinted with Kino history, with the filmmakers that have made Kino throughout the years, and, of course, their movies ! It is as part of these festivities that they will present their event "15 ANS / 15 FILMS" (15 YEARS / 15 FILMS ). To select their movies, Kino asked 15 directors who each chose their favourite short film. Prepare yourself for a screening high and varied in emotions and genres! POP Montréal’s Film POP is proud to honour the one and only Adam Yauch (1964-2012) at this screening. Better known as Beastie Boys’s "MCA", Yauch was at once a prolific musician and a seasoned film fan. Closeted videoclip director, he created, under the moniker "Nathanial Hornblower", some of Beatie Boys’s best clips, from the recent "Make Some Noise" (2011), to the memorable tribute to kaiju that was "Intergalactic" (1998), or again "Body Movin’" (1998), inspired by Mario Bava’s "Danger : Diabolik". In 2008, Adam Yauch films Gunnin' For That #1 Spot, his first and only documentary film. In it, we follow eight college basketball rookies as they prepare to show off their talent to the whole world at « Elite 24 », an all-star match taking place at the legendary Rucker Park field in Harlem. Saturday, July 12 and Sunday, July 13, from 9 PM, Fantasia, in collaboration with SAT, the NFB, Ztélé and 24 Heures, presents the return of Fantasia under the stars ! On the schedule, 2 screening evenings : "McLaren à la belle étoile" (McLaren under the stars), a collection of shorts directed by Norman McLaren, on July 12, and "Projet M", in a feature-film version, directed by Éric Piccoli, on July 13. To celebrate McLaren's 100-year anniversary, Fantasia, joined by the National Film Board of Canada, presents MCLAREN UNDER THE STARS, an event regrouping a dozen of his best short films. The collection offered covers not only different periods of the master's career, but also investigates the different animation techniques he experimented with over his long and fruitful career. Projet-M, the famous science-fiction web series from Quebec, directed by Éric Piccoli, is back, but this time presented in a feature film version ! The production, whose plot wavers between science fiction and psychological thriller, stars amongst its main actors Julie Perreault, Jean-Nicolas Verreault, Pierre Verville, Nadia Essadiqi, Julien Deschampsx Jolin and Marie-Ginette Guay. Come discover at Peace Park the documentary "Autoportrait sans moi", produced by the National Film Board of Canada, hosted by director Danic Champoux ("Mom et moi", "Séances"). At the era of social media, here are 50 individuals unveiling some of their intimacy and sharing their personal life experiences to the camera. A free and open choral work celebrating the diversity of life, as 50 individuals confide part of their intimacy to the camera. In the era of social media, this human mosaic presents us with a mirror of our society, while also revealing its author. Prends ça court! presents "Québec Gold, a collection of last year’s most notable short films from Quebec. A unique opportunity to see, in one screening, the films that have traveled throughout the world’s most established film festivals ! The Orchestre de la Francophonie welcomes you to a musical evening starring original motion picture soundtracks at Peace Park. During this event, you’ll have the opportunity to hear music from the "Star Wars" saga, from the historical drama "Schindler’s List" and from the classic science-fiction movie "E.T". Présence Autochtone (Montreal First Peoples Festival) presents the feature-film "Maïna", hosted by director Michel Poulette, who will make a statement shortly before the screening. The feature-film will follow the short "Corriger le tableau", directed by a collective of young Atikamekw. Following a bloody confrontation between her tribe and the tribe of the « Men from the Land of Ice », MAÏNA, daughter of the innu Grand Chief Mishte-Napeu, finds herself on a mission that will change her life. To celebrate the 10 years of the Montreal International Black Film Festival (MIBFF), the Fabienne Colas Foundation is happy to present an outdoors screening of the movie "CASE-DÉPART", by Thomas Ngijol, Fabrice Éboué and Lionel Steketee. The FIFBM want to offer the most surprising discoveries of the black cinema from around the world, and also to be a place for debate of important cultural, social, and socio-economic issues. "CASE DÉPART" had an enormous success when released in France with around 2 million tickets sold ! The only thing that half brothers Joël (Thomas Ngijol) and Régis (Fabrice Eboué) have in common is their barely-known father. At his bedside before his death in the Antilles, their only inheritance is the manumission contract that liberated their enslaved ancestors, a document passed down from generation to generation. Disregarding the symbolic importance of this document, they rip it apart. Determined to make them pay for what they've just done, a mysterious old aunt that was watching them since their arrival decides to make them go back in time, in the midst of slavery ! Dropped in 1780, they will be sold at the market as slaves. Both brothers will then have to unite, not only to flee the plantation, but also to find a way to go back home, in the 21st century. The CINEMANIA Film Festival is happy to present "2 Automnes, 3 Hivers", in collaboration with SAT, as part of its series of outdoor screenings. The movie, by director Sébastien Betbeder, premiered in North America in November 2013 at the last edition of Cinemania and is once again presented at Peace Park. "2 Automnes, 3 Hivers" was selected by the Association pour le cinéma indépendant et sa diffusion (ACID) at the 2013 Cannes Film Festival. Young Arman is stuck in his routine. Without any viable career or partner, he moves to Paris, to start over his life. Amélie is in the same situation. During a jog in their neighbourhood, they exchange eye contact and are attracted to one another, but they're too shy to really make first contact. Quite some time later, their second encounter will give Arman the opportunity to become a true hero. Cinema Politica, a network dedicated to the screening of socially engaged documentary film and founded in Montréal, will present at this screening the themes of global indigenous and anticapitalist resistance. From Iran, to Brazil, to Burma, to the Palestine refugee camps in Lebanon, the film wants to create ties with local activism. Local guests will be there to talk and answer questions after the screening. In 2003, at the dawn of the war in Irak, director Iara Lee undertook a trip to improve her understanding of an increasingly conflicted world, which seemed, to her, doomed to self-destruction. Her travels took her around five continents where, over a few years, she met a growing number of people dedicating their life to promote change. For this year’s event, the Rencontres internationales du documentaire de Montréal chose to dedicate their screening at Peace Park to Austrian filmmaker Michael Glawogger, deceased on April 23, 2014, at the age of 54. The RIDM will present the second part of his trilogy on work and labour, "Workingman’s Death", on September 2, the day after Labour Day. Michael Glawogger, who died of malaria during a film shooting in Liberia, was one of the most original and bold voices of contemporary documentary. From a mine in Ukraine to a Chinese metal plant, an Indonesian volcano, an open air Nigerian slaughterhouse, or a Pakistani beach, the famous documentary filmmaker questions the place of extreme manual labour at the dawn of the 21st century. No interviews, no comments, only striking and haunting images and music (by John Zorn). At once subdued and breathtaking, as original as is it brutally poetic, Workingman's Death is an unforgettable sensory leap and one of the most significant documentaries of the 00s. Montréal’s Festival du nouveau cinéma is celebrating the 30-year anniversary of Wim Wenders’s cult film "Paris, Texas" with a screening of the restored version of this nostalgic and sensitive road-movie (Palme d’or prize at the 1984 Cannes Film Festival). A man suddenly reappears after wandering for four years, a time about which he doesn’t give any explanation to his brother, who’s come to meet him. He leaves for Texas with his son, looking for Jane, the child’s mother. A quest towards the unknown, this mutual discovery brings together two beings each with a disturbing past. Travis hadn't given any news over four years, when he goes back to his wife and son, following a n odd set of circumstances and a long period of wandering in the desert. He was trying to get to Paris, in Texas. By adding to the poetic portrait of the main character, Texas's beautiful landscapes, we get one of the most beautiful depictions of the 1980s. Founded and based in Montréal, Double Négatif is a collective of artists of the moving image dedicated to the creation and dissemination of experimental and avant-garde cinema. Thanks to their constant efforts in revitalizing the indie movie scene, they’ve built a unique place for themselves in the Montréal and national artistic communities. Featured film : De Profundis by Lawrence Bros.
DE PROFUNDIS is a fascinating and alluring investigation of Oscar Wilde's project of transgressive aesthetics. By incorporating family films from the 1920s, homo erotica, images from Radical Faerie meetings and gay pagan rites, radical drag queen performances and images of confinement, the film shows an investigation haunted by masculinity, strangeness, history and sexuality. The International Festival of Films on Art (FIFA) is a non-profit organization devoted to the promotion and presentation of the world's finest productions on art and media art. When you think America, what comes to mind? Car culture, big business, advertising, religious fundamentalism, consumer society, militarism, suburbia, office towers, and the technology of paranoia? The film Imagined States of America takes on the myths to get at the heart of a country that continues to fascinate the world. Inspired by the photo collages of Québec artist Pierre Guimond, and incorporating an intricately built soundscape, this film is like a dream on the verge of a nightmare as America is revealed with all its paradoxes. This dance performance is viewed from various perspectives: that of the dancer, the audience, and from an objective point of view, as mere code. Through this prism a different and variegated world—the performance—is depicted, into which we are irresistibly drawn. Featuring choreographer-dancer Johanna Nuutinen. 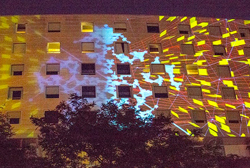 A new mapping project will also be presented from June 13 on the Hôtel ZERO 1 walls during every screening evening ! Created by TiND (Francis Théberge) and developped specifically for the place de la Paix screening series. Presented by the Society for Arts and Technology and the Quartier des Spectacles, in collaboration with arrondissement Ville-Marie.